Hi! 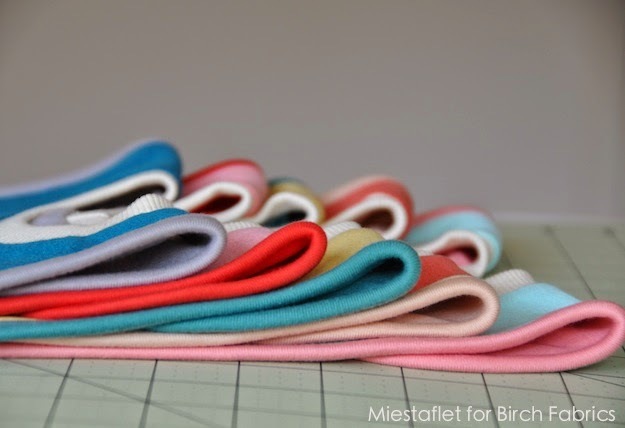 I'm Annelies, I blog at Miestaflet and I’m so excited today to share a tutorial for a reversible pullover bib in the brand new Organic Solid Knits by Birch Fabrics. I could not believe how soft they are! And all those colors… Oh, how fun it is to play with the combinations. These bibs don’t have any ties or velcro or snaps. 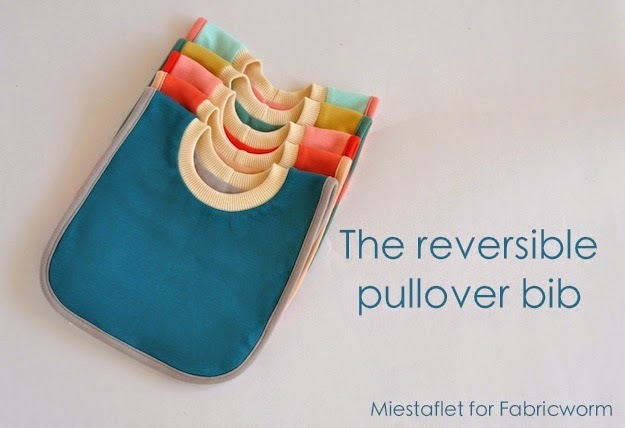 Yet they have a soft neckband in rib knit to put the bib over the head of your baby or toddler. My youngest even prefers this type of bibs because she can put it on and off herself. 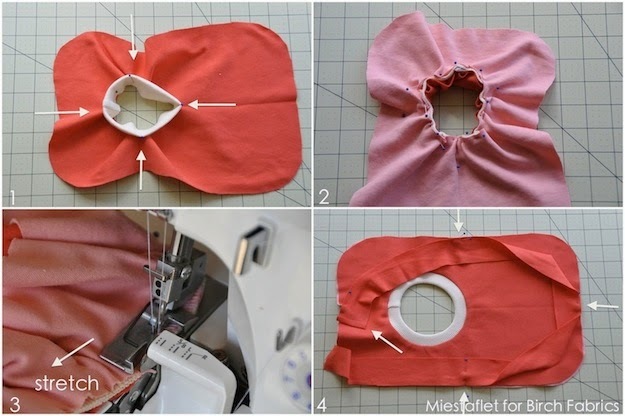 (1) Place the pattern on the fold and cut out the bib from both knits. Be careful not to stretch the knit fabric when you cut. 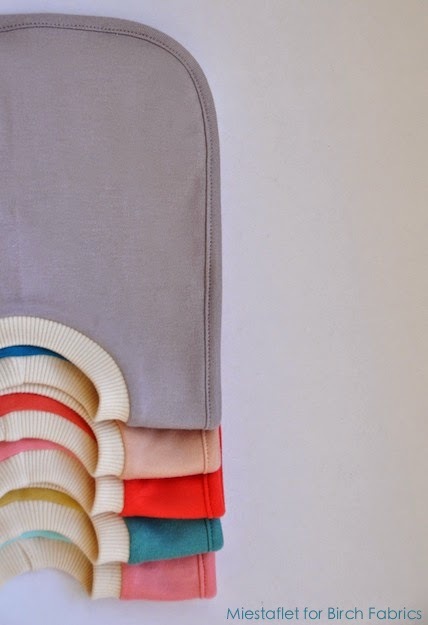 You can use fine pins or weights to keep your pattern in place. Make sure the fabric stretches in the right direction. Mark the notches (you can use your iron machine to mark them). (2) Cut a long strip, 1 ½ ” wide x 35 “ long from one of the knits. (3) Cut the rib knit 2 “ wide x 10 “ long. 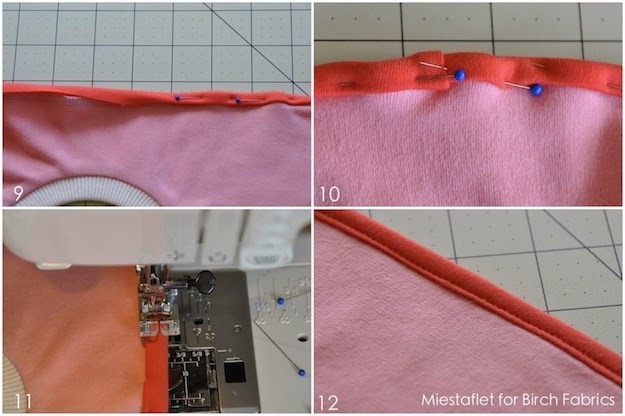 (1) Fold the rib knit lengthwise, right sides together and sew or serge the short open sides using a seam allowance of 1/4 “ (If you don’t have a serger, you can use your regular sewing machine using a stretch stitch.). Give it a good press. 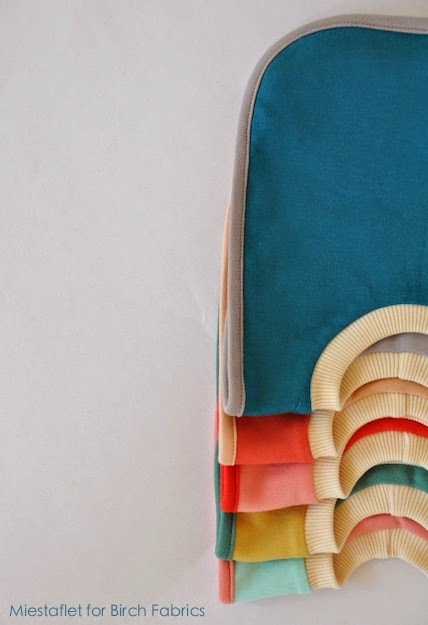 (3) Place it on your sewing table with the seam on the left side and put a pin on the right side. (4) Then place those 2 pins on top of each other and put a pin on both sides. (1) Pin the neckband on the neck opening of one of the knits, aligning the marks and the pins, right sides together. Align the seam of the ribbing with the middle of the neck opening at the back. It will look all wrinkly, but that gets solved later. (2) Next you put your other knit on top of that, right sides together. Take your time, pinning all layers carefully together and sandwiching in the ribbing neckband. (3) As you sew this seam, gently stretch out your ribbing. Be careful NOT to stretch the knit fabric. Sew or serge slowly making sure all layers stay together and do not shift. Turn the bib right sides out and give it a good press. (4) Align the long strip with the side of the bib in the same color, folding back the beginning of the strip ¼ “ at the start. (5) Serge or sew, right sides together (1/4 “ seam allowance), leaving the first inch un-sewn. You need to stretch the strip as you sew, not too much though. It gets easier with practice. 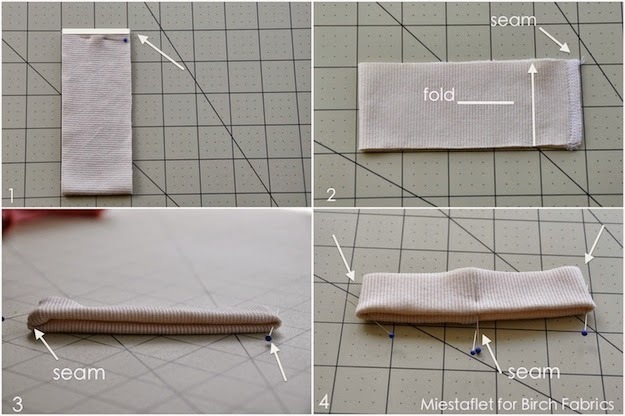 If you are not sure about how much to stretch out the strip, you can also divide your strip in 4 equal parts (folding it half wise 2 times) and divide it equally around the bib (folding the bib 2 times in opposite directions and matching those points with the marks on the strip) (4). 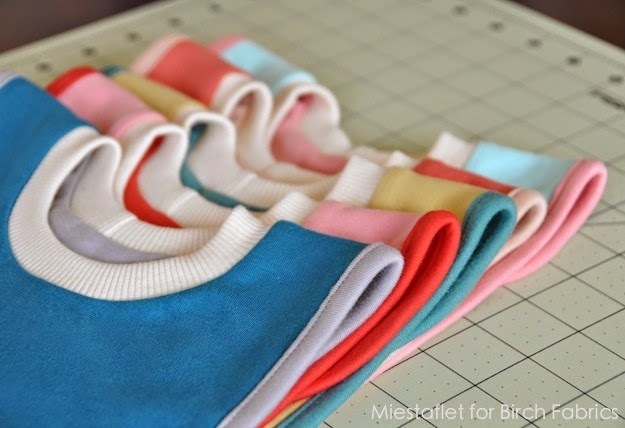 (7) When you have serged or sewn almost all around the bib, put the end of the strip on top of the beginning and sew them together (the beginning of the strip will be folded back). Cut out a corner to reduce the bulk. Give it a good press. 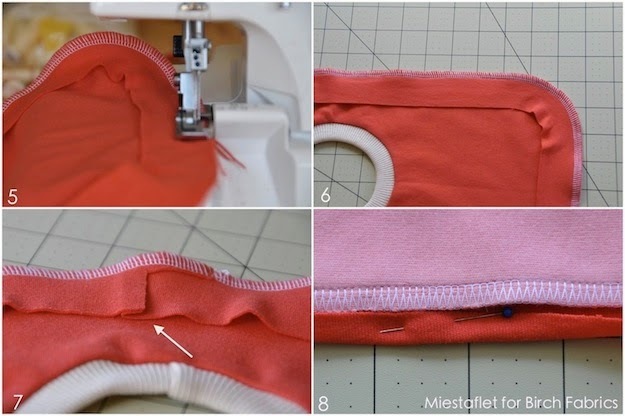 Turn your bib to the other side, fold the strip in until it touches the outside of the bib (8) and pin it to the opposite side so it just covers the seam (9). Just look at all those pretty colors! This is great, thank you for the tutorial! I love these bibs, I can't wait to try this. These are beautiful, thank you for the tutorial! May I ask where you purchased your rib knit? I find it fairly hard to find the right rib knit for this type of application. I purchased the rib knit at Jo-Ann's and although it is not organic, I do love the quality. I agree it's not easy to find rib knit in cute colors and good quality. Maybe the Fabricworm team could change that? These are super cute! In trying to make some right now and I'm a little confused about how to sandwich the rib knit between the top and bottom? I can't tell what's going in the pic because they are solid colors...thanks! Hi Ashley, always put your right sides together. If you use prints, they will be on the inside of the 'sandwich'. Once you have attached the neckband, you turn the right sides out again. Happy sewing! Yay, Andrea! That's wonderful news! Sooo looking forward to that! How do I print the instructions? Shelley, this is the link to the pattern: https://miestaflet.files.wordpress.com/2015/04/the-reversible-pullover-bib-by-miestaflet-pattern.pdf (you can also click on "printable pattern" in the instructions). I just made one of these and it's lovely! It's also tiny, guess my little lady has a big ol' noggin! It won't go over my 4 month old baby's head. Thanks for sharing such wonderful information and loved the designs. 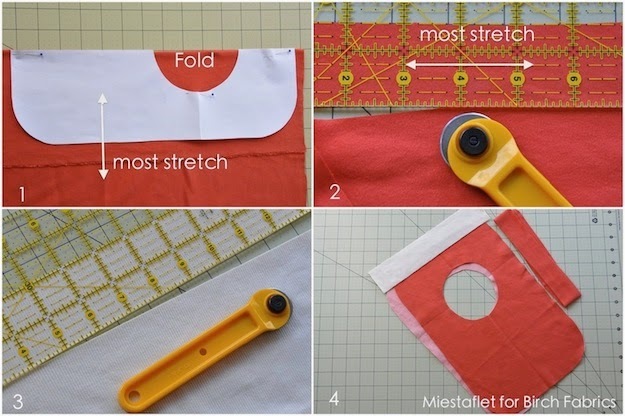 I was stuck with the folding part!It is very easy to Sew some fabric but has to be done with care! When my kids were little (they're 11 and 7 now) these were my absolute favorite kinds of bibs, easy on easy off. When you have a squirmy toddler, you need easy. I think I even added a pocket to one or two of the one's I made to catch all that food :-). Now I'll make them for friends. I tried making one but was not happy with the final design. So, now I've started doing some Wedding Photography blog as photography is my passion. Thanks for the wonderful post! keep sharing such good work! We also do some Photography work like Indian Wedding Photography team based in New Delhi, India. I'm in love with your blog. Knowledge is good if you share it with others as well. Thank You! We also do some kind of blog posts in Wedding Photography as you know..
Hey everyone! Lovely post. I also do some sort of blog posts in every field! I am just not seeing the measurements for cutting out the bib itself. ?